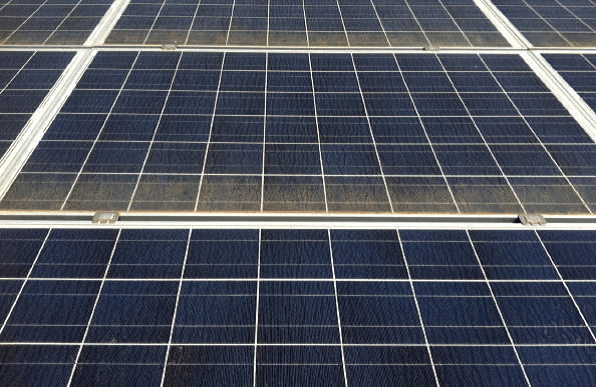 What Are Soiling Losses on a Solar Panel? When Should I Normally Clean My Solar Panels? There are many factors that can reduce the power yield of a solar PV system: Shadings, PID, LID, ohmic, thermal, and mismatch losses among others. However, on this occasion we are going to focus on soiling and how we know when to clean the solar panels to avoid soiling losses. Soiling losses are attributed to the reduction in solar irradiance to the solar panel due to the presence of a layer of dirt, mud, leaves, dust, snow, or bird droppings that might obstruct a section of the solar panel. These things do not allow the conversion of light into electricity to be carried out effectively. This can radically reduce the power output and energy yields of solar panels in very extreme cases. Soiling losses will depend on multiple factors such as location, relative humidity, industrial and mining activities in nearby areas, snow, the absence of cleaning, the presence of dust, sandstorms, or even volcanic ashes from distant volcanos. Regions across the world such as the Middle East need a constant maintenance in order to compensate the losses attributed to soiling and sandstorms that can radically reduce the performance of a solar array. As odd as it may sound, the US is not exempt from the presence of dust storms. Actually, in July 2018, Arizona experienced a tremendous sandstorm. Other States such as Nevada, California, Utah, Oklahoma, and Colorado have also experienced sandstorms, unpleasant for both the population and PV systems. Quantifying soiling losses can be hard, as several factors need to be considered. However, soiling patterns across the world can be classified according to dust intensities in the research performed by M.R Maghami, called Power Loss Due To Soiling On a Solar Panel. As soiling concentrates on the solar panel, the losses attributed to this factor increase on a monthly basis and could lead up to 30 % annual losses (and even more in extreme cases). Therefore, it is necessary to develop a maintenance routine in order to maximize energy yields of solar panels and to keep soiling losses around 2% – 5% annually. Source: Power loss due to soiling on a solar panel – M.R Maghami. After you install your solar PV system you should take a look at the energy yields of the first month period. Depending on your location and the season that you installed the PV system, the energy yields can vary. However, once you have the first complete annual performance of the PV system it is likely to be similar in the next 5 years (solar panels degrade over time, so the performance of year 1 is not the same as year 15). Keep those numbers for your records and try to check the generation of the solar system on your inverter display at least once every 3 months. If reductions in that period are too different from previous seasons, then it is possible that something is affecting the performance of your PV system. Probably the reason will be either shading of a nearby object or that your solar panels are getting dirty. Moreover, whenever there are unusual construction sites nearby related to your neighbors’ house upgrades, or to local government projects, it is likely that your solar panels will catch some particles of dust. If the construction takes several days, then it is probable that dust will accumulate further. Winter is an annoying season for solar panels because snowfalls can continuously leave snow on your roof. 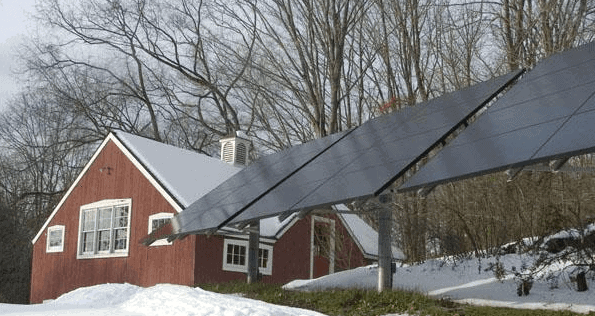 If the few hours of Sun that are available will be completely blocked by snow, then the performance of your solar panels during the winter season will reduce. This doesn’t mean that you have to go out there to the roof every day to clean your PV array, because solar panels also get hot and can melt down the snow by themselves. Nevertheless, whenever you see a strong snowfall outside, keep in mind that your solar panels may need a little help. During the winter season, it is ideal to check on your modules at least once every month. Rain is a favorable meteorological condition for solar panels. Ideally, your solar installer should have considered in the design to minimize maintenance of the PV system. In order to do so, the solar installer should at least place the solar panels with a 15° tilt angle that will allow rainwater to do the dirty work and clean your solar panels. This shouldn’t be a problem in the US because all locations have latitudes above that angle, but keep it in mind. Based on the importance of rain, if rain in your area have been scarce or the region is passing through a drought period, it might be a good idea to take a look at the PV system. Moreover, if there has been a long period where you haven’t cleaned your solar panels, and the rain finally appears, a couple of days later might be good to take a look as well at the PV array. The reason is that dust can be transformed into dirt when mixed with water, and despite the fact that the rain will clean most of the surface of the solar panel, the remaining dirt could accumulate on the borders and corners of the frames. If they do not incorporate a drainage system (or are frameless) then it will be a spot for the accumulation of moisture and humidity that can lead to other problems such a leakage currents or delamination of the PV cell. Establishing maintenance routines is the best idea to keep a record and control of the PV system. Generally, it is recommended to clean solar panels at least once during spring and summer seasons unless unusual events occur. Regarding the autumn season, cleaning should be made once or twice due to falling leaves that may obstruct the solar panel. And during the winter season, at least once every month (if the solar panels do not melt the snow by themselves). Moreover, when you decide to clean your solar panels, keep in mind to do it preferably during early hours (6:00 am – 7:00 am) or during late afternoon (5:00 pm-6:00 pm). There are two reasons for this. 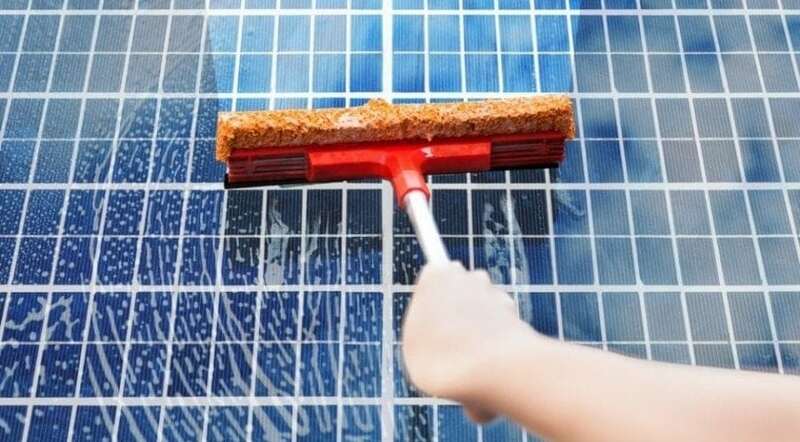 First, you will not obstruct or affect the performance of the solar panels during a productive time, therefore the cleaning procedure shall not represent energy losses. And second, solar panels get hot due to energy conversion and due to the ambient temperature. Performing cleaning during midday on hot solar panels under the scorching sun might not be the most pleasant experience.